AboutSpas loves this post by @ChloeSocial who really knows her stuff when it comes to social media. I have taken the liberty to highlight some of the points that stand out to me, but do read the full blog on the link below. It’s seriously inspiring. The best thing about social media marketing is how easy it is to get free and organic brand awareness and website traffic. However, if you’re not getting much reach or engagement on your social media posts, then there really isn’t much that it can do for you. So what do you do? If you’re saying “Give up,” then you are wrong and the two of us need to have a serious chat, my friend. You never give up. 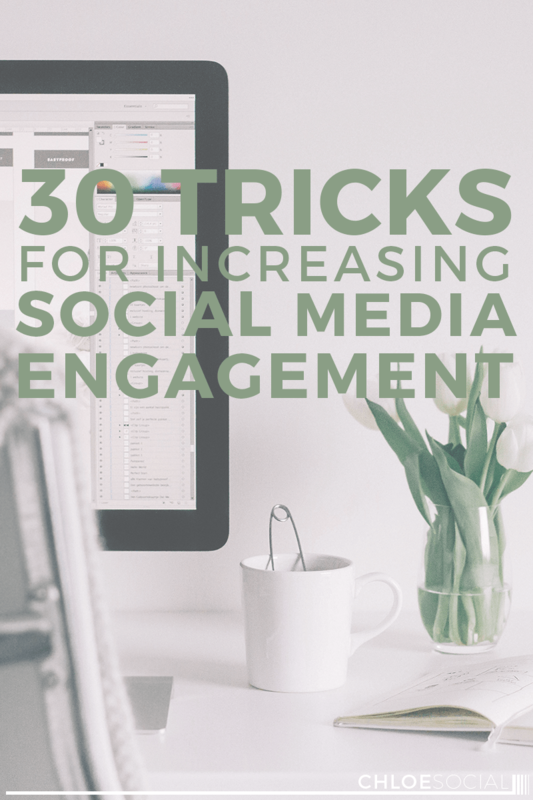 What you do is learn how to be strategic with your posting and check out these sure-fire tricks for increasing social media engagement. Are you a bit unsure of how to use hashtags properly in a way that benefits you? Well, before we get into anything, go read my post on using hashtags to promote your business right meow. 2. Hashtags on Pinterest look spammy and need to GTFO. 3. You should use two hashtags per tweet, maybe three, but after 2 hashtags, engagement actually drops 17%. 4. Hashtag the shish kabob out of your Instagram posts–photos with 11+ hashtags get the most engagement. Did you know that by the simple act of including an image in your tweet, you can get a 150% increase in retweets? This is a great feature if you are, in fact, talking directly to a person. In fact, I love this feature during Twitter chats because my profile only shows my answers to each question and not my giant clog of tweets interacting with other participants. However, if you’re mentioning someone, but it’s also a tweet that you want your followers to see, be very careful about how you word the tweet. Move the mention into the middle section or at least put a “.” or another symbol at the beginning, rather than the “@” symbol. Are you sharing articles from or about other brands, blogs, or businesses? The next time you post one of these, tag the Facebook Page of the brand that the article mentions. Not only does this notify the owner that you’re sharing their article (which they always seriously love), but your post will also be shown to their fans as well as your own. In a world where Facebook reach is practically zilch, we’ll take all the help that we can get! If you already have a great presence on Instagram, then this little trick might be right up your alley. Create a hashtag on Instagram that pertains to your business/blog and invite others to post photos using your hashtag. Then, occasionally, you can feature the best images. Great examples of these hashtags are #TNChustler by The Nectar Collective and #ABMlifeiscolorful by A Beautiful Mess. This is mutually beneficial because it brings awareness to your hashtag and your Instagram but also shows other Instagram profiles and photos off to your own followers. You’re fabulous. Let your followers get to know you on a personal level. Switch it up and occasionally tweet something that’s not all business. What do we, as followers, love more than getting to see what your life is like #nofilter style? Absolutely nothing. We eat that shiz right up. Take photos of your work space, your latest living room furniture setup (because I know I’m not the only one who rearranges their furniture every three months or so), your cute new heels, or anything. Give us a peek into your life and who you are. As a blogger or solopreneur, your brand is you, so let us see you. Not only are these great for engagement but they’re funny as hell. Find a funny picture, ask your followers to give it a caption, and laugh for days. Rather than having this be an “educational” fill in the blank where there is only one right answer, simply post a silly phrase and have your followers fill in the blank with something funny. Post the first sentence of a story and ask your followers to help you write the story by posting the next sentence in their comments. There are seriously a million different ideas that you could come up with for this, but I’m going to give you a few examples of stellar contests anyways. – Host a poll on your Facebook Page that asks follower opinions about something. Example: An electric company asks followers how they’re going to lower their electric bill this month: unplug chargers while they’re not in use, turn off lights every time they leave a room, or turn down the thermostat? – Ask followers to submit photos in a certain category. Photo with the most votes wins a prize. Example: For Halloween, a pet groomer asks followers to post photos of their pets in their Halloween costumes. – Give a prize to your Nth follower. Example: You are almost to 1,000 likes on Facebook, so you announce that the person who is like number 1,000 gets a prize. When we’re using social media for business and for promotion, a lot of times we forget that the whole point of social media is simply to interact with other people and brands. The next time you log onto Twitter, scroll down your timeline and look for posts that you can simply respond to and start up a conversation. Or pay attention to your new followers’ bios and start up a conversation based on something that the two of you have in common. Obviously, one of the best ways to increase social media engagement is to simply do it yourself by striking up a conversation. Ask a question and you will get answers. Answers = engagement. Voila. You could ask your followers a thought-provoking question, like what niche they would consider their blog/business to be a part of. Or you could ask your followers for feedback on your next ebook cover or something else that you’re working on. Or you could ask your followers for input on a topic that you could reference in your next blog post. If you love something, you should always make sure that that something knows it. For example, you love your social media followers, so make sure that they can feel the love by occasionally sharing exclusive product/service discounts and promos just for them. Maybe it’s 15% off your newest ebook with a special promo code or a free informational handout if they retweet your tweet. You decide what you want to do to show your followers how much you love and appreciate them. Also foot rubs are always nice. What would the internet be without memes? It would be NOTHING, that’s what. Okay, maybe that was a little bit dramatic. But seriously, could you imagine living in a world without memes? I know I wouldn’t want to. You can turn any bad day right back around just by perusing the humor section of Pinterest. Put a smile on your followers’ faces by sharing your favorite memes. Do you know when your followers are online? Check out this post I wrote about finding the perfect times to post on social media. By discovering when your followers are actually online, you’ll be able to get your posts in front of the most eyes possible, increasing the likelihood of people engaging with them. We live in a world full of obedient people. In fact, if you just flat out ask someone to “Like” or “Retweet” your post, they usually will. If you’re a part of a collaborative Pinterest board, then you’re able to get your pins to more than just your own audience–they will also show up for the audiences of everyone who participates in that Pinterest board. Depending on the amount of pinners on the board, that could be thousands of more eyes on your pins. Looking for a collaborative Pinterest board to join? Email me if you’re interested in my Creative Biz Tips board! Hosting a giveaway is a great way to gain exposure and followers on social media. You can have people enter by liking your Facebook Page or following you on Instagram and then use a tool like Rafflecopter to choose a winner. Just be sure that you read the rules for giveaways on the platform of your choice so that your giveaway isn’t causing any policy violations. It’s pretty easy to understand that if you only post to Facebook or Twitter once or twice a month, that you’re probably not going to get the best engagement rate. Come up with your posting schedule and stick to it. How can you expect engagement on your own social media posts if you refuse to engage with others? At least once a week, make a point of visiting the Facebook/Twitter/Instagram pages of your favorite bloggers/business owners and liking/commenting/responding to one of their posts. This works out well because many times, they will return the favor. 22. Get involved in groups and communities. Take advantage of Facebook groups, Google+ communities, and LinkedIn groups. Be active, respond, make connections, and just be regularly involved. This puts your name out there and usually leads to new followers and sales leads. I’m involved in a couple of great Facebook groups and can’t tell you how invaluable I find them. Check out this awesome article from Olyvia.co showcasing some of the best Facebook groups to join. Whether you’re sharing pieces of the product while they’re still in progress or sharing sneak peeks of products that you’re about to release, people love to see your latest and greatest project. They want to ask questions, congratulate you, prepare their finances so that they can buy it from you, and things like that. For example, you could post photos of your product’s cover or branding to Instagram or you could post an excerpt of your upcoming ebook to Facebook to generate buzz. Someone in my office recently brought his new selfie stick to work and ran around the office taking photos with everyone. You can best believe that those made their way to our company’s Facebook Page. You don’t need to have a selfie stick (in fact, please, please, tell me that you don’t have a selfie stick), but selfies always make for great social media posts. Most of the time the photos of ourselves will be professional images. Take a candid photo of yourself every now and then to share with your followers. This is a great way to find new bloggers/business owners that you want to follow along with, find tweets to engage with, and find awesome articles that you want to read. It’s like a goldmine in the Twitter search catacombs. You might search for hashtags like #socialmedia, #blogging, #photoshop, #designerproblems, and things like that. I’ve done social media for a dry cleaner before, and we liked to search for the hashtag #laundryproblems and engage with the tweets we found with funny quips.